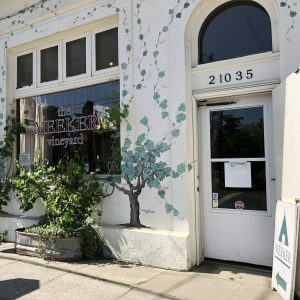 If you’re looking for a fun, relaxed, unique place to hang out and taste amazing wines, come visit us! You’ll find us right at the four-way stop where Highway 128 meets Geyserville Avenue in the old Bank of Geyserville building, complete with the original vault from 1903, and near-original teller windows. With your Priority Wine Pass, you’ll receive complimentary tastings for two, and we’ve got something for every palate. Reservations are not required, but we do appreciate a heads up for larger groups. Our founder and original winemaker Charlie is often here to regale you with stories, and Austin the Goldendoodle and Remy the Maltese will greet you properly at the door. For us, wine means family. Charlie and Molly started home winemaking in a basement in the early 1970s, and in 1977 we bought our first vineyard in Dry Creek Valley. Now we’re into the second generation of Meekers with Lucas at the helm, focused on creating and sharing wines with character. We’d love it if you tried our wines and got to know our family.